Not to be confused with Holman Stadium (Nashua). 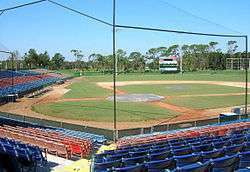 Holman Stadium is a baseball stadium in Vero Beach, Florida, built in 1953 from an abandoned Naval base, to accommodate spring training for the Brooklyn Dodgers as part of a complex now called Historic Dodgertown. In addition to the Dodgers' spring games, it was also the home of the Vero Beach Devil Rays, previously the Vero Beach Dodgers, of the Florida State League, through the 2008 season. Official seating capacity is 6,500. The then-Brooklyn Dodgers were one of the first major league baseball teams to conduct spring training in Florida, establishing their operations in this quiet beachside town in 1948. Previously an abandoned Naval base, the complex was transformed for the Dodgers. Historic Dodgertown and Holman Stadium served as their spring home for more than 60 years. In recent decades, Arizona has established itself alongside Florida as the second major center for spring baseball, and the Dodgers were the last western team to still conduct its spring training in Florida. 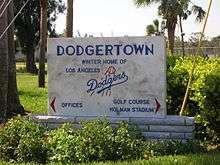 In 2001, the Dodgers seriously considered moving their spring training operations to Arizona, but the city of Vero Beach persuaded them to stay by purchasing the Historic Dodgertown complex from the team and leasing it back for a nominal $1 per year. In 2006, the Dodgers again received offers from several Arizona cities, attempting to persuade them to move. Ultimately, the offers were too lucrative to overcome the burden of having to reimburse Vero Beach for purchasing the complex. With the Camelback Ranch opening in Glendale in 2009, the Dodgers joined the Chicago White Sox to share the new facility. The Dodgers' last spring training game in Vero Beach was on March 17, 2008. Holman is unique for its open-air dugouts that are literally dug out along the sides of the field. These may have been the inspiration for the dugouts in Johnny Hart's B.C. comic strip. "This place is so different from any other park", states George Betscha, a batboy at Dodgertown from 2005–2008. "There is so much history here and you can feel it when you walk around." In addition to baseball, the Holman Stadium complex and conference center has hosted training sessions by the New Orleans Saints. The Saints visited Dodgertown for training camps through 1984. The Green Bay Packers, the Cleveland Browns, the Buffalo Bills, the New England Patriots, the Kansas City Chiefs, the Philadelphia Eagles, and the college teams of the Miami Hurricanes, the Ohio State Buckeyes and the University of South Florida Bulls. Holman Stadium has also played host to some international teams such as the Yomiuri Giants, the Chunichi Dragons, the Osaka Buffaloes (Japan), the Samsung Lions who also returned for visits in 1992, 1993, 1995 and 1997. the LG Twins, the SK Wyverns, teams from Korea. The Sinon Bulls Taiwanese team, the Nigeria national baseball team and the Moscow Red Devils. Including on March 31, 1961 at 7:30 p.m., famed evangelist Dr. Billy Graham held a Good Friday service at Holman Stadium during his Florida Crusades, joined by a Crusade choir of locals numbering nearly 400. The Baltimore Orioles were recruited to move up to Vero Beach in 2010, from their spring home in Fort Lauderdale, but after failing to reach an agreement, the City of Vero Beach rescinded its offer. The city is exploring other options outside of Major League Baseball spring training. Reports surfaced in 2009 that the Major League Baseball Players Association was considering Holman Stadium as an alternate training site for players who entered the spring as unsigned free agents. However, the MLBPA decided not to go forward with the plan. As of 2015, nearby Dodgertown Elementary School has not changed its name. The United Football League expressed an early interest in using the Historic Dodgertown facility as a training and practice grounds, but no agreement to do so was ever reached. During the final (2012) season, each team utilized a training site in or near its home market. Dodgertown became the Vero Beach Sports Village in 2010. It is now used for sports tournaments including baseball and football tournaments, concerts and other special events. In 2013, former Dodger owner Peter O'Malley and current Dodger ownership, headed by President Stan Kasten, reached agreement to re-brand Vero Beach Sports Village under the name Historic Dodgertown. Historic Dodgertown now holds year round youth sports tournaments in baseball, soccer, lacrosse, and Minor League Baseball's Umpire Training Academy. ↑ "Holman Stadium Dedication". Retrieved 30 September 2011. ↑ "Historic Timeline 1974". Historic Dodgertown. 2013. Retrieved 2014-03-22. ↑ "Historic Timeline December 17-21,1985". Historic Dodgertown. 2013. Retrieved 2014-03-22. ↑ "Historic Timeline December 28-31,1985". Historic Dodgertown. 2013. Retrieved 2014-03-22. ↑ "Historic Timeline January 6-11,1987". Historic Dodgertown. 2013. Retrieved 2014-03-22. ↑ "Historic Timeline December 23-27,1987". Historic Dodgertown. 2013. Retrieved 2014-03-22. ↑ "Historic Timeline December 31, 1990 to January 4, 1991". Historic Dodgertown. 2013. Retrieved 2014-03-22. ↑ "Historic Timeline January 1-6,1996". Historic Dodgertown. 2013. Retrieved 2014-03-22. ↑ "Historic Timeline August 26-September 6 1992". Historic Dodgertown. 2013. Retrieved 2014-03-22. ↑ "Historic Timeline December 12-23,1995". Historic Dodgertown. 2013. Retrieved 2014-03-22. ↑ "Historic Timeline 2010". Historic Dodgertown. 2013. Retrieved 2014-03-22. ↑ "Historic Timeline 1961". Historic Dodgertown. 2013. Retrieved 2014-03-22. ↑ "Historic Timeline 1988". Historic Dodgertown. 2013. Retrieved 2014-03-22. ↑ "Historic Timeline 2002". Historic Dodgertown. 2013. Retrieved 2014-03-22. ↑ "Historic Timeline February 5-20, 1992". Historic Dodgertown. 2013. Retrieved 2014-03-22. ↑ "Historic Timeline 2000". Historic Dodgertown. 2013. Retrieved 2014-03-22. ↑ "Historic Timeline November 2011". Historic Dodgertown. 2013. Retrieved 2014-03-22. ↑ "Historic Timeline 1999". Historic Dodgertown. 2013. Retrieved 2014-03-22. ↑ "Historic Timeline 1993". Historic Dodgertown. 2013. Retrieved 2014-03-22. ↑ "Dodgers Now". Los Angeles Times. 2011-11-10.